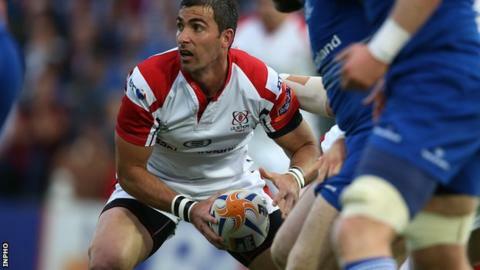 Ruan Pienaar and Dan Tuohy are poised to return for Ulster in Saturday's European Champions Cup tie against Scarlets at Kingspan Stadium. Pienaar has not played for Ulster this season having suffered a knee injury playing for South Africa in September. Tuohy broke his arm during a Pro12 match against Cardiff 10 weeks ago. "Dan and Ruan both trained the last two days and if there is no reaction, they might potentially be involved at the weekend," said Ulster coach Neil Doak. While delighted at the prospect of the pair being involved in the back-to-back fixtures against Scarlets, which Ulster must win to keep alive slim hopes of qualification from Pool 3, Doak is not expecting too much from his returning internationals. "It's good to have them back on the paddock but let's see how they react and come through. "We just have to see how Ruan's knee reacts. "It is a different kettle of fish when you are training on your own, but when you get in a team environment and it is twisting and turning, it is live stuff now. "Hopefully both of them can get in the mix this weekend. To have those experienced players coming back in, it is good to have." Ulster are struggling to qualify for the knockout stages of Europe for the fifth year in a row after losing their opening two games against Leicester and Toulon. They have achieved good league results and are second in the Pro12 table, despite being shorn of internationals such as Pienaar, Tuohy, Andrew Trimble, Jared Payne, Iain Henderson and Paddy Jackson at various stages of the season. Doak said: "Hopefully over the next period of time we can get back the rest of the international guys who are sitting on the sidelines and give us a real boost." "We know it is going to be a difficult period coming up to Christmas with Irish camps and then the Six Nations, so we just need to get everybody back on board so we have a full deck to select from." Ulster captain Rory Best is delighted that the injured players are beginning to return, particularly ahead of the difficult home and away matches against Scarlets over the next two weekends. Wing Tommy Bowe, who scored tries in Ireland's autumn international victories over South Africa and Australia, sat out last week's defeat by Munster but will also return to the starting 15 on Saturday. "You want your international players playing," said Best. "Hopefully we will have Tommy back, and Ruan and Dan will play at some point, whether it is this week or the week after, we know they are on the way back. "They are international players, Ruan is a top, top international player, and everyone wants to see them back out on the pitch. "As players you want your strongest team out. "You build a squad for when you are missing players, but ultimately on the big occasions you want your top players and you want to give a good account of yourselves with your full team out."